Thank you so much for the incredible response to my video announcement from this past Monday. I am so excited to finally launch The Purpose Podcast for you guys and to start sharing stories of inspiration that will motivate all those who so desperately need it when times are tough. In today’s video, I’m sharing the one common thing each of our podcast guests has shared as being an easy and successful way to get through even the most dire of circumstances. The secret to resilience is learning to live in the “now”. Check out today’s video to learn how to go about taking things day by day, and how in doing so you’ll not only be able to better process what you are experiencing, but learn what will make you happy despite your circumstances. In the video, I also take some time to answer some of the most common questions I received after the last video, including what you will learn from the podcast, and how to listen to it when it launches. I’d love to hear from you!What questions do you have about the Purpose Podcast or our guests? Leave a comment below, I’ll be answering them in my next video on Friday this week, as well as providing exact details on what to expect the day the show launches. Thank you everyone for checking out Monday’s video! If you missed it, I was sharing how excited I was to finally be launching the first few episodes of the Purpose Podcast on January 7th! On the show, I interview guests who have experienced every adversity ranging from battling eating disorders, rebuilding after natural disasters, surviving sexual abuse, recovering from life-threatening diseases, and more. By listening, you’ll discover the purpose of your own adversity as we discover ours, and you’ll leave the episode feeling inspired and motivated to become the person you’ve always known you could become. As a survivor of miscarriage, abuse, divorce, and suicide loss myself, I found each and every conversation I’ve had on the podcast to be so incredibly inspiring and healing, and believe that you will too. Today I wanted to share a quick way that you could start to begin healing following adversity and do so quickly. 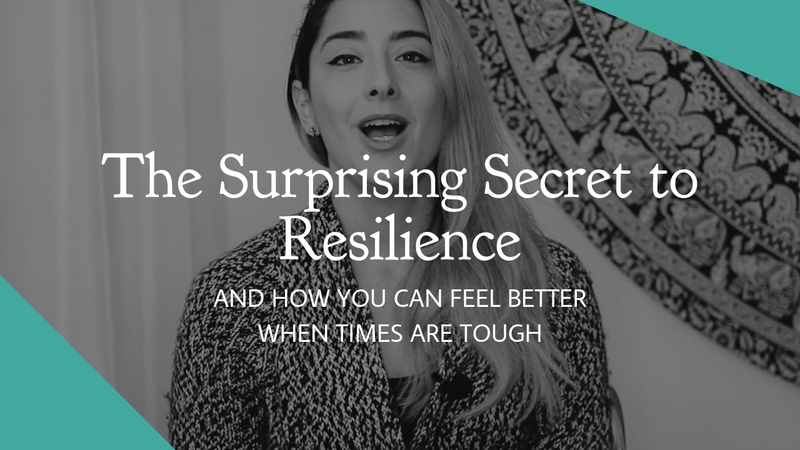 It’s a method that every single guest has alluded to on the show, and helps form the foundation for resilience and encourage a positive mindset. No matter what life has thrown your way, remember that it is only temporary, and that things always get better. The easiest way to do this, is to try live in the moment and to take your life day by day. This means each morning when you wake up, to only focus on what needs to happen that day, and what you can do to make yourself happier even if it’s only for that day. Having this mindset helps you better determine what you need in that moment to process and manage the experience of what you are going through. For example one day you may wake up and have a difficult time emotionally. When taking things day by day, you accept it for what it is, experience the pain to its fullest, do what you need to do to get through it, and go to bed remembering that tomorrow is fresh start. It’s also exploring what activities can you do during that bad day that would help you feel better? For many of our podcast guests, it was activites like going for a walk to be in nature, or a creative hobby such as painting. One guest while recovering in the hospital after being hit by a car passed time by learning magic tricks, which later sparked an entire new career for her! When focusing day by day it’s easier to see exactly what you may enjoy doing because there is no pressure that you have to KEEP doing it. It provides relief when you need it. Also when things are bad, you’re not denying that they aren’t. It’s instead keeping the mindset that yes, it’s a bad day today but that doesn’t mean that tomorrow will be one too, and keeping the faith that it will be. Today I also wanted to thank you all for the questions you’ve been sending in regards to the podcast. I’m going to take a few moments right now to answer a few of the most common ones. How do I listen to the show? You have several different options to listen. First is you can visit my website the day the episode airs. Select “Podcast” in the menu and you will see the most recent episode at the top. Click on the post and you will see the episode summary, supporting links, as well as a media player where you can hit play and listen to the episode directly from the website. For up to date announcements on when episodes air, you can join my email list, or follow me on Facebook, Instagram and Twitter and get updated there. You can also listen and subscribe to the show directly from iTunes, Apple Podcasts, Spotify and Stitcher. What will I learn from the show? On the show our guests share the stories of their own adversity and how they not only got through it, but managed to use their challenge as a means to ignite personal growth. All the guests featured either experienced drastic career changes, created support organizations, or became involved in public outreach for causes that are important to them. By listening, you’ll not only learn tactics you can use to navigate your own adversity, but will be inspired and motivated to get started as soon as possible! How often will episodes air? As of now, we are scheduled to air every other Monday starting on January 7th. This may change as the show gains popularity and more guests become involved, or as our listeners request different types of topics or episode formats, but as of now, you can count on every other week. I love what you’re doing! How can I help spread the word?! Oh my goodness thank you so much!! The very first thing you could do that would help out would be to share the episodes that resonate with you on social media. You could either re-share the post announcements from my own accounts or better yet take a screenshot of you listening to the episode with a recap of why you loved it, posting it and tagging me @iamcorrielo. Another way you could help me out big time would be by writing a review the day the podcast airs. This will help the show get into “New and Noteworthy” lineups and even further expand our audience and access to future guests! Thanks again for joining me today. Don’t forget to leave any comments or questions about the show below or drop me a line on Facebook, Instagram or Twitter. I’ll be back this Friday with a sneak peek of what to expect in our first episode, and the exact details on the show’s launch on Monday January 7th. This entry was posted in Adversity, The Purpose Podcast and tagged adversity, anxiety, depression, podcast, self-development, self-help, stress.